Mark’s Asperger’s affected his independence; he lacked confidence, did not like being on his own and would only go out of the house if accompanied by a support worker. 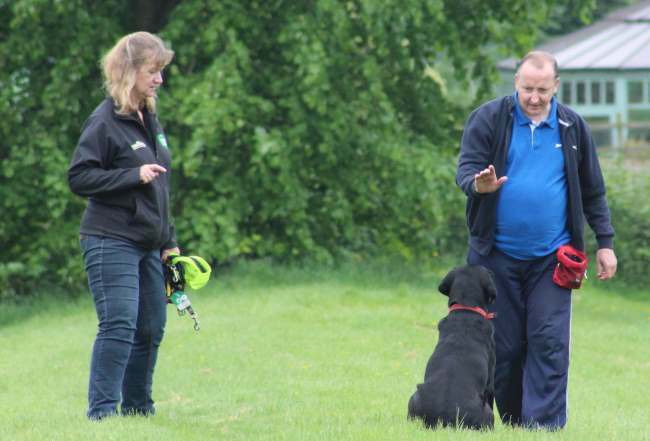 Supported by Kingwood, Mark works in structured Animal Assisted Intervention (AAI) sessions with handler Sarah and Community Dog Max, and as a result his motivation has increased, enabling him to develop new skills and gain the confidence to achieve his goals. Dogs tend to accept a person for who they are regardless of differences or abilities. This non judgemental relationship can have a huge positive impact on confidence, self esteem and self belief. With Sarah, Mark has been walking on a dual lead with Max in parks and shopping centres, By taking responsibility for Max out in the community, Mark has learned he is capable of looking after his own needs, as well as the dog’s, and this can help him become less dependant on support staff, ultimately leading to being able to go out alone. Playing games gives Mark the opportunity to have fun with Max and gain a better understanding of creating positive relationships with others. Working with Sarah and Max on dog obedience promotes self esteem, as the dog responds to his commands. Learning to communicate with the dog helps to increase confidence and gives a sense of accomplishment. Mark has been working with Sarah and Max for around five months now and he has become more confident to go out into the community by himself without the need for a support worker. He’s now started working towards an ASDAN qualification on animal care, in order to help him work towards volunteering with animals in the future. Mark volunteered for one of his sessions with Max to be filmed by BBC TV local news to help promote the community dog project. This was a great opportunity for Mark to show how much he has achieved towards his goals and seeing himself on television has the potential to positively impact on his self esteem.